As low as $932.92/month with No Interest for 12 months. Learn More. Quick Ship Items labeled Quick Ship will ship within 2 business days from our East Coast warehouse. Actual delivery times will vary based on your location. If you are ordering multiple items and not all items qualify for Quick Ship, the order will ship when all items are available to ship. Quick Ship may not apply to multiple quantities of the same product. Counter Depth Counter depth refrigerators have a case depth of 24 inches. They stop where your kitchen counter stops, creating a clean, built-in look at half the built-in price. Spill Safe Shelves Accidental spills inside the fridge will be contained by the rim’s design on these shelves, keeping messes from dripping down onto other contents below. Spill safe shelves also make cleaning a cinch. Continuous Grates Continuous grates have a clean, flat look across the whole cooktop, and they also make it quick and easy to transfer pots and pans between burners. Electronic Display An electronic display monitors the progress of your wash cycle so you can know when the cycle is finished. Child Lock After you set all controls exactly how you want them, employ the child lock to avoid unintentional changes to your settings. Adjustable Upper Rack The adjustable upper rack is great for making room below for large pots, pans, and cooking sheets, or also for long stemware in the upper rack. Chimney Style The duct cover column on chimney style hoods are typical of pyramid styles, contemporary flat hoods, and curved glass hoods. It's a refined look that works in any kitchen. Wall Mount Wall mount hoods generally feature a chimney above the hood, and the three exposed faces of the hood go out and to the front and sides over the cooking surface. Convertible Venting Type Convertible hoods can either be vented to the exterior of your home, or you can recirculate the air in the kitchen through filters in the hood if you're unable to reach the exterior. Refrigerator Capacity: 15 Cu. Ft.
Freezer Capacity: 7.2 Cu. Ft.
Total Capacity: 22.2 Cu. Ft. 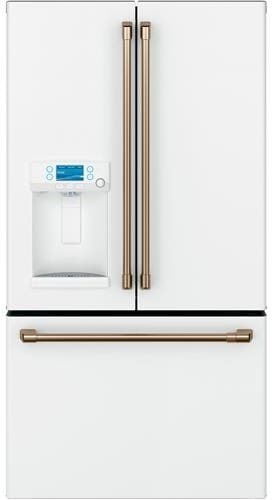 Enjoy a glass of filtered water and cubed or crushed ice whenever you want with the external dispenser on this counter-depth French door refrigerator from GE. Steep a relaxing herbal tea or prepare light & fluffy couscous with an adjustable hot water dispenser that provides precise temperatures and measurements. Food remains fresh longer with TwinChill™ evaporators that accurately maintain and control separate freezer and refrigerator environments. Keep key ingredients fresh and within sight with a full-width, electronic, temperature-controlled drawer that uses an LED colored lighting system. Use your voice or smart device to preheat water from your refrigerator while you relax in another part of the house. This unit is also customizable - select any combination of premium finishes and hardware options to create a stunning look to suit your kitchen. Create a built-in look with counter-depth design that fits flush with surrounding cabinetry! GE Consumer and Industrial spans the globe as an industry leader in major appliance, lighting and integrated industrial equipment systems and services. They provide solutions for commercial, industrial and residential use in more than 100 countries which uses innovative technologies and "ecomagination." It's a GE initiative to aggressively bring to market new technologies that help customers and consumers meet pressing environmental challenges to deliver comfort, convenience and electrical protection and control. GE brings imagination to work. Enjoy a glass of filtered water and cubed or crushed ice whenever you want with the external dispenser. Steep a relaxing herbal tea or prepare light & fluffy couscous with an adjustable hot water dispenser that provides precise temperatures and measurements. Leave the measuring cups in the drawer with a Precise Fill setting that dispenses an exact amount of water with just a touch. Food remains fresh longer with TwinChill™ evaporators that accurately maintain and control separate freezer and refrigerator environments. Keep key ingredients fresh and within sight with a full-width, electronic, temperature-controlled drawer that uses an LED colored lighting system. Use your voice or smart device to preheat water from your refrigerator while you relax in another part of the house. Primary Oven Capacity: 6.2 Cu. Ft. 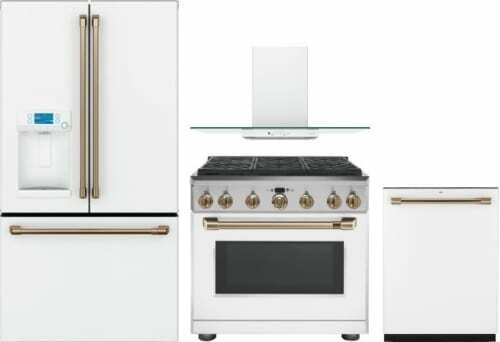 Whip up an unforgettable meal with a professional oven system that combines reverse-air convection technology with an infrared broil and gas burner to provide superb baking results and fast preheating. Bake more batches at once with a 6.2 cu. ft. capacity caterer's oven that can fit up to three full-size sheet trays. Smoothly slide heavy roasts in and out of the oven with full-extension, heavy-duty roller racks that can also stay in the oven during self-cleaning cycles. Experiment with every cuisine with reversible burner grates that are flat on one side and contoured on the other to accommodate round-bottom cookware like woks. 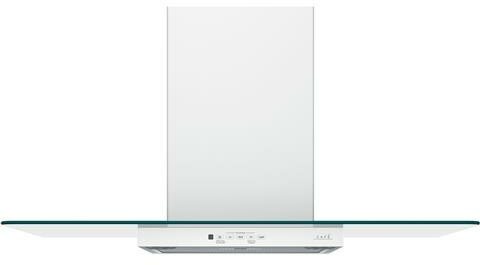 Enjoy a full range of heat settings from ultra-low simmers to intense boils, with six sealed 18K BTU dual stack burners. Confidently cook over a steady flame with the electronic ignition's automatic reignition feature that instantly revives any accidentally extinguished flames. This appliance can be customized so you can select any combination of premium finishes and hardware options to create a stunning look to fit your kitchen design. 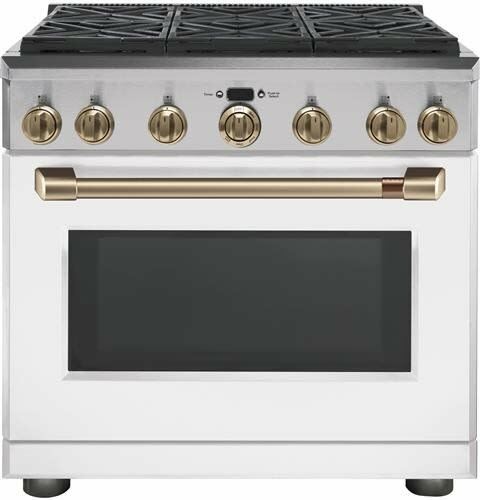 35 3/4" - 36 1/2"
Enjoy a professional oven system that combines reverse-air convection technology with an infrared broil and gas burner to provide superb baking results and fast preheating. Enjoy a full range of heat settings from ultra-low simmers to intense boils, with six sealed 18K BTU dual stack burners. Experiment with every cuisine with reversible burner grates that are flat on one side and contoured on the other to accommodate round-bottom cookware like woks. The oven self-cleans for easy maintenance. Confidently cook over a steady flame with the electronic ignition's automatic reignition feature that instantly revives any accidentally extinguished flames. Smoothly slide heavy roasts in and out of the oven with full-extension, heavy-duty roller racks that can also stay in the oven during self-cleaning cycles. This fully integrated dishwasher from the GE Café™ Series comes with an advanced wash system with over 140 cleaning jets that deliver complete coverage to every inch of the dishwasher. Easily clean an entire dinner-party's worth of flatware at once with a convenient third rack across the top of the dishwasher. Spotted silverware has no place at your table, thanks to deep clean silverware jets that ensure every utensil comes out looking immaculate. Vases, canisters and bottles are always clean and ready for your tablescape due to the targeted washing power of bottle jets. This unit also comes equipped with a Piranha™ hard food disposer so you can spend less time at the sink pre-washing. The hard food disposer's stainless steel blades pulverize food particles and prevent clogging. Create more room for platters, baking sheets, stemware and more with an adjustable upper rack that glides up or down 2-inches with one easy touch. Dry heat-sensitive or fragile dishes with a hidden vent with fan dry that gently circulates air to remove moisture. A sanitize option is also available for a high-temperature rinse that is NSF Certified and reduces bacteria found on dishes by 99.999%. And with Wi-Fi Connect, now you can operate your dishwasher from your smartphone. Track and automatically reorder detergent and rinse aid with just the tap of an app. Easily clean an entire dinner-party's worth of flatware at once with a convenient third rack across the top of the dishwasher. Set a stunning table with dishes that sparkle thanks to the industry's most Advanced Wash System with over 140 cleaning jets that deliver complete coverage to every inch of the dishwasher. Spotted silverware has no place at your table, thanks to Deep Clean Silverware Jets that ensure every utensil comes out looking immaculate. Spend less time at the sink pre-washing and let the hard food disposer's stainless steel blades pulverize food particles and prevent clogging. Vases, canisters and bottles are always clean and ready for your tablescape thanks to the targeted washing power of bottle jets. Get dishes impressively clean with the revolutionary reversing quad-blade lower wash arm and its 25 spray jets to hit items from every angle. Create more room for platters, baking sheets, stemware and more with an adjustable upper rack that glides up or down 2-inches with one easy touch. Dry heat-sensitive or fragile dishes with a hidden vent with fan dry that gently circulates air to remove moisture. High-temperature rinse sanitizes and reduces by 99.999% the bacteria found on dishes. Always have clean dishes ready for surprise guests with WiFi Connect, which lets you operate your dishwasher from your smartphone. Track and automatically reorder detergent and rinse aid with just the tap of an app. Select any combination of premium finishes and hardware options to create a stunning look customized to any owner's taste. Keep your kitchen smelling fresh and ready for guests with a 350-CFM venting system with boost that removes smoke, grease, odors and moisture. Add a conversation-starter to your kitchen with electronic backlit controls that look great and are easy to use. Clearly watch the progress of preparing your favorite meals with dual halogen cooktop lighting that brightly illuminates the cooking surface. See your way through midnight snacking with a night light that softly illuminates the cooktop and surrounding areas. Fill the kitchen with fresh air with two convertible venting options: recirculating or external venting. Share favorite stories without interruption, thanks to an optional remote control that can change lighting and fan speed settings from anywhere in the kitchen. Keep conversations flowing without interruption thanks to an auto-off feature that deactivates the vent after 15 minutes. 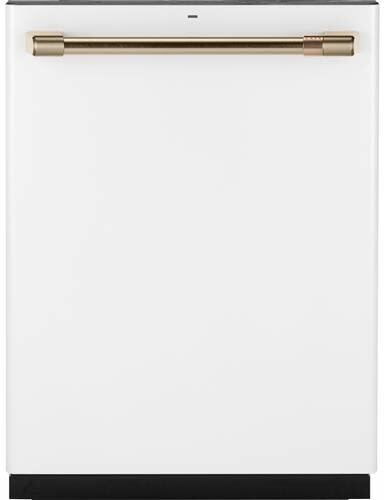 Simplify clean-up with a dishwasher-safe filter that removes grease and can be cleaned alongside dishes too. Keep your kitchen smelling fresh and ready for guests with a 350-CFM venting system with boost that removes smoke, grease, odors and moisture. Add a conversation-starter to your kitchen with electronic backlit controls that look great and are easy to use. Clearly watch the progress of preparing your favorite meals with dual halogen cooktop lighting that brightly illuminates the cooking surface. See your way through midnight snacking with a night light that softly illuminates the cooktop and surrounding areas. Keep conversations flowing without interruption thanks to an auto-off feature that deactivates the vent after 15 minutes. Fill the kitchen with fresh air with two convertible venting options: recirculating or external venting.